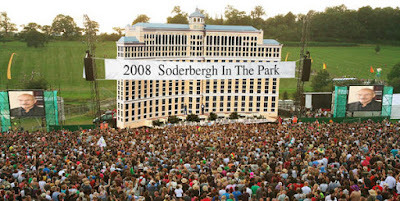 The Playgoer: Soderbegh in the Park! The Public's latest plan for spicing up the Delacorte next summer? "The mission of Soderbergh in the Park has always been to bring Soderbergh to the masses," Fletcher said. "And that includes even his more inaccessible material. Those who are skeptical will be pleased to find that many of the traditional Soderberghian themes are present in Ocean's Twelve: anger, betrayal, despair, the travails of cool wealthy people who plan crime capers, and brotherhood." Okay, fine it's The Onion. But almost fooled ya, huh? "Soderbergh is never easy," Kline said. "I remember when I first saw Ocean's Twelve. I didn't get why the jokes were funny, it was way too long, and the plot was so incomprehensible that I nearly walked out of the theater." "But since then, I have come to appreciate the scope of the piece," he added. "Though I admit that even after extensive study, the ending still remains a mystery to me." I'm waiting for "Schizopolis: The Musical!" myself.